Palm made of Synthetic Leather, Inside Gel Padding. High-impact areas for increased shock absorption and protection. Elastic Wrist with Hook and Loop Fastener provide more protection. Hook and Loop Closure Strap with your choice of logo on Cycle Gloves. Available in Adults and Children Sizes XXS - XXXL. Customize Logo and Custom Designs are being offered for Cycle Gloves. Our Cycle Gloves / Bike Gloves produced in Good Quality of Material with best prices. 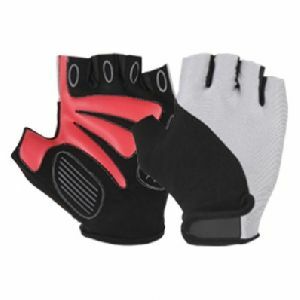 Cycle Gloves are available in different colors as per customer's requirements. Back Stretchable Fabrics / Lycra are available with any kind of sublimation printing as per custom design of Cycle Gloves. Synthetic Leather Palm Available with Silicon Printed for more grip, as per custom design of Cycle Gloves. Artificial Leather Scerno, Synthetic Leather (Amara), Cowhide Leather, Goat Leather, etc.